This Is Getting Old: Yinz Luv 'Da Buccos...wait, for real? Yinz Luv 'Da Buccos...wait, for real? Jim Shearer, the mastermind behind the web-series Yinz Luv ‘Da Guins and Yinz Luv ‘Da Stillers, is answering a question he’s been asked ever since he started his homemade, YouTube sports shows three years ago: Do yinz luv ‘da Buccos? The answer is “yes.” In his Opening Day: Yinz Luv ‘Da Buccos exhibit on display at Wildcard through the month of April, Shearer pays homage to the Pittsburgh Pirates of his youth (back when it was somewhat customary to end a season with more wins than losses) in a series of portraits of beloved players. Using the same art tools he wielded as a youngster, each image is created with colored pencils, crayons, magic markers, and watercolors. 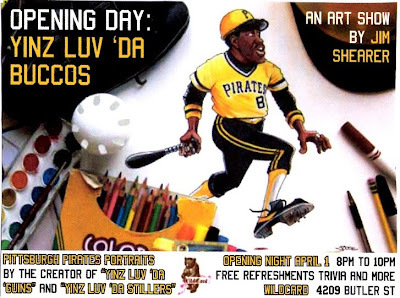 To coincide with the Pirates’ first game of the season, Opening Day: Yinz Luv ‘Da Buccos will have its opening night celebration on Friday, April 1 from 8-10PM. The event is free and includes complimentary drinks and refreshments, along with a Pirates trivia contest and other surprises.